After Griddle scones, today we are landing towards one of the early American staple food prepared with cornmeal called Johnny cake. Johnny cake is also known as journey cake, jonny cake, shawnee cake and johnny bread. Johnny cake goes for yellow cornmeal,this food might have been probably originates from the native inhabitants of North America and it is still eaten in West Indies, Dominican Republic, Bahamas, Colombia, Bermuda and also in United States.Johnny cake is a type of pancakes or a unleavened cornbread prepared with cornmeal,water and milk.Johnny cakes may also prepared using leavening or without also with eggs or not. 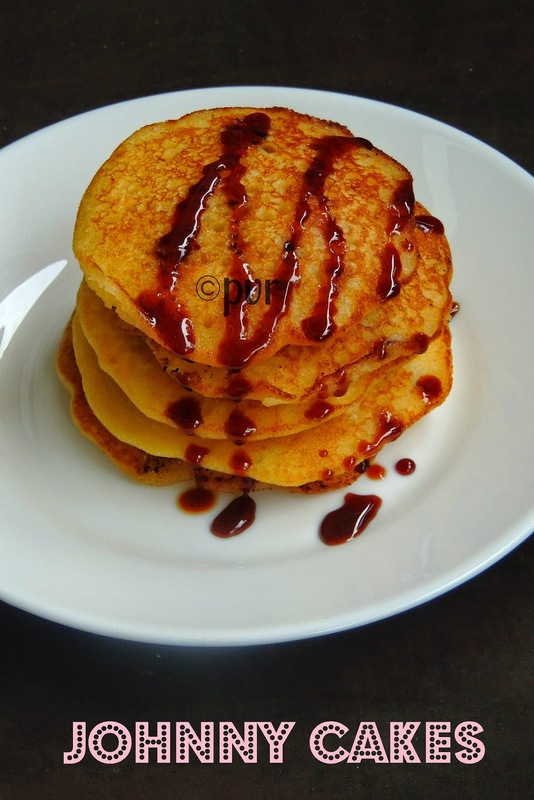 Like pancakes, they are often served with maple syrup,honey or with an other sweet toppings. However Johnny cakes seems to be prepared with many variations, everyone have their own way of making these cakes. I opted for a simple version of this recipe from here, this easy version of Johnny cake goes for a yellow cornmeal batter prepared with boiled water,milk along with sugar and salt. This batter later cooked in griddle or pan with butter gives an excellent flavor to this pancakes.This Johnny cakes is my second recipe for the theme of this week's blogging marathon. My theme for this week is Do E-N from the List of Breakfast Foods given by Srivalli.Check out the Blogging Marathon page for the other Blogging Marathoners doing BM#41. Sending to my own event Healthy Diet- Healthy Breakfast guest hosted by Nandoo's Kitchen. In a bowl, whisk together the cornmeal,sugar,salt. Add in the boiling water and mix until it forms a paste. Gradually add the milk, whisk well and check the constitency of the batter. The batter will looks like thin mashed potatoes. Heat a griddle or a frying pan, melt enough batter. Spoon the batter as per need, spread them to make a flat pancake. Cook on each side until its turns golden brown. Serve warm drizzled with your favourite syrup. that looks so tempting and perfect for rainy days..I will keep eating it until it gets over..
so easy to make and tempting cake.. Delicious and lovely looking cake. Wonderfully prepared. Looks great! Everytime I visit your blog, I learn something new! Interesting name of the dish. looks so yummy. Priya, that's a new one for me, and sounds so interesting..
loved these yummy cakes ..they look tempting..nice name too..
What a fun name for the pancakes! looks tempting n sounds easy to make.. Instead of cornmeal, can I use something else? Actually i am still not clear what is cornmeal? is it same as corn flour? @MadhoooCornmeal is corn semolina, you can make the same pancakes using semolina/rava.But am not sure about the taste, hope this helps. 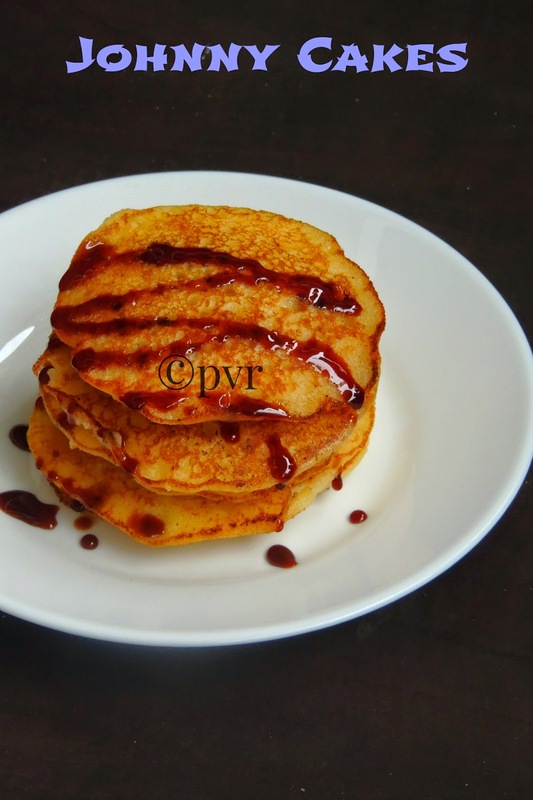 OMG, the pancakes look so delicious, and the clicks makes them more tempting..
Yummy pan cakes.. You are making me hungry. They look tempting and I was contemplating between them and hash browns for the same theme next week. Great idea for pancakes. Sooji/semolina pancakes also turn out good.